Revitasize has a passion to deliver you cold-pressed, fresh, raw organic juices daily. They understand that your hectic life can leave you with little room to take care of yourself. Their juices will help give you the nutrients your body needs. By offering only the freshest ingredients in their products and delivery services, they make living a healthier lifestyle a reality. 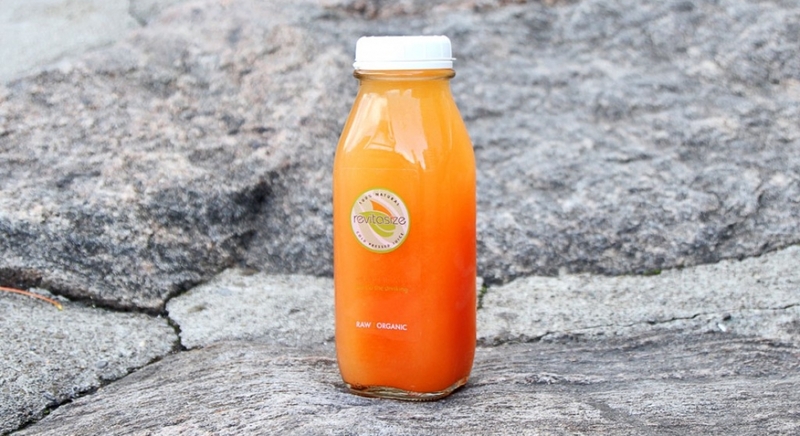 Juice cleanses allow your digestive system to rest while your body targets and eliminates harmful toxins. This natural process helps you deal with addictions, heal digestive organs, promote cellular repair, treat disease, and increase energy levels. From the Pink Lady (strawberry, beetroot, pineapple, ginger, lemon, chia) to Just Green (broccoleaf, dandelion, collard green, kale, watercress, cabbage, parley, lime, cucumber, celery, lemon), they provide you with the freshest, most nutrient dense organic cold-pressed juices. Their menu features Organic Salads, Energy Protein Balls, and Raw Shakes. This ultra modern shop has a Yorkville Avenue storefront just west of Bay. Their inviting location is spacious and well decorated with very friendly service. While I was there I had “Kelp Yourself” with grapefruit, kelp and orange. After indulging in this delicious drink I felt more energized and ready to take on whatever the day held for me! I especially enjoyed their packaging that had “Kelp Yourself” written on the lid and came in a reusable glass bottle. Revitasize is now offering mobile payments and loyalty rewards with SmoothPay. Use our app at their 70 Yorkville Avenue location to spend $50 and get rewarded $3. Our app lets you discover great locations in your area where credits and first time offers are automatically applied to your transaction.